as colden grows, we've been moving our things higher and higher. at this point, little is unreachable, although he hasn't begun moving furniture to climb up and access higher shelves. but, he has gotten the hang of the doorknobs. at first it was difficult to keep him out of the garage (and all its wonders and terrors), but now he is pretty content to 'leave it closed right now'. and i have to say that it's quite sweet when he hears the dogs whining to come in and lets them in. he closes the door behind them too. sometimes i even ask him to go take care of them! how great is that? so we thought we might be able to get away without purchasing those plastic door handle covers that prevent children from opening doors while still allowing adult access. then, the other morning, marc woke up and colden was out of the bedroom. (i was still sleeping). with all the christmas lights, cole's fondness for electrical outlets and candles, the occasional stray pin, well. i guess this was a wake up call (ha!). 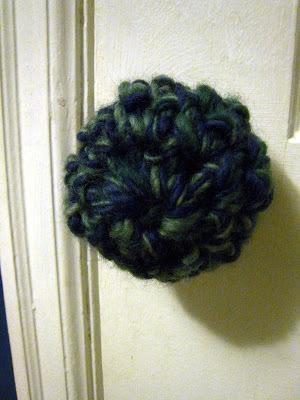 marc proposed the idea long ago for a crocheted cover, and well, it was just easy as pie. we may not need it for long, or we may need more, but either way it is not going in the landfill ever, beautiful to look at and touch, and didn't cost a dime. hooray!